This entry was posted on June 3, 2010 at 10:35 am and is filed under Absolute Certainty, Absolute Theocracy, Absolute Truth, Absolute Truth War, American Gospel, And they will know that we are True Christians by our Pure Doctrines!, Anger, Apostates, Argh....!, Arminians go to hell, Arminians will burn, Brian McLaren, Calvinazis, Calvinism is the Gospel, Calvinism=True Christianity, Chris Rosebrough, Chris Rosebrush, Emergent Village, Emergent/Emerging Church, Emergents, Emergynts, Evil Mystics from Hell!, exempt, exemption, False Vs. 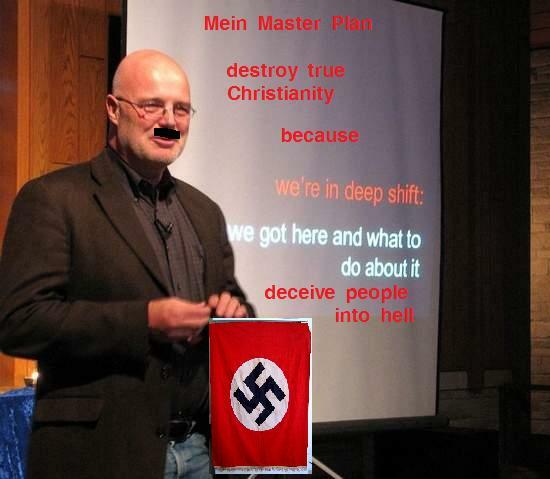 True Converts, Fascists, God is Hate not love, god of wAr, God's Sovereign Wrath, Hitler, Holy conspiracy theories, No, Oppose, Our Holy Republican American Reich, Our Master Plans, Our slaves, Pirate Radio, pirates, Postmodern Unbelievers, Postmodernism, Pure Bible-teaching, Pure Doctrines, Puritan scrooges, repent, Slice/Cross-Talk, Spiritual Terrorists, the devil, the Good Ole Days, Things to outlaw, Universalist Conspiracy Theories exposed, US vs. them, We love Theocracy!, We're always Right, We're not like them., We're Right because We're Right Wing!. You can follow any responses to this entry through the RSS 2.0 feed. You can leave a response, or trackback from your own site.